There are many sub-species of the Savannah Sparrow. This specific sparrow is seen all over North America, from the northern shores of the Arctic Ocean, right into the very southern regions of Mexico. These sub-species are broken up by their habitat locations. The most common among them, is the Savannah Sparrow (taiga). These sparrows nest right across the northern continent. In the winter months, they are seen as far as the southern regions of Mexico. Depending on the time of the year, the Savannah Sparrow (Ipswich) are seen along the eastern coast, from Nova Scotia to Florida. Its primary nesting ground is Sable Island, located in the Atlantic Ocean, near the city of Halifax, Nova Scotia. 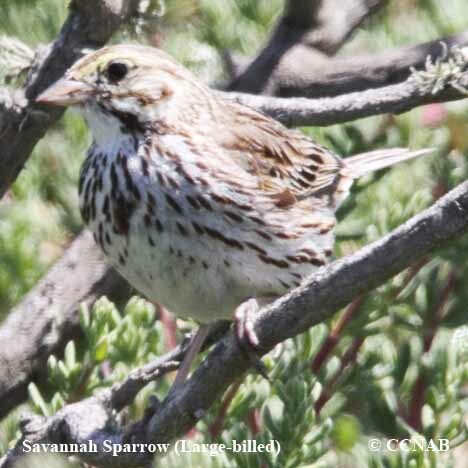 The Savannah Sparrow (Belding's) has the smallest range, starting from southern California to the southern tip of the California Baja. The Savannah Sparrow (Large-billed) is seen in this same area, its range also extends a short distance down the northwestern coast of Mexico. Then, there is the Savannah Sparrow seen in the northwestern areas of North America and are identified by their darker reddish-brown plumage. The Savannah Sparrow is one of the most common birds seen on the North American continent. They prefer pastures, hay fields, grasslands and the stunted trees (shrubs) of the northern tundra. Once one hears their songs, it will be easy to remember. These greyish-white colored to dark brown sparrows will be easy to seek out. Observing the tops of fence post or on the fence lines is an ideal place to find them in the agricultural zones.